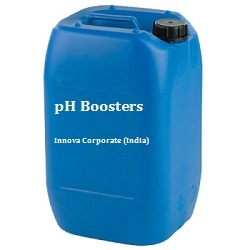 Innova Corporate (India), We are one of the leading Importers, manufacturers in Assam, Suppliers and Dealers of pH Booster from delhi based, we deals in finest quality of pH Booster in Assam, manufacturers of pH Booster, dealer of pH Booster, suppliers of pH Booster, pH Booster, pH Booster manufacturer in Assam, pH Booster Suppliers in Assam, pH Booster dealer. We manufacture, Export and supplies pH Boosters Chemicals for variety of boiler and various operating pressure. pH Boosters is made from refined raw materials, latest manufacturing techniques and modern machines to ensure reliability of the product for the suitable application. The pH Booster Chemical is specially formulated to be utilized for boiler feed water as alkalinity source to minimize the corrosion of pumps, lines and feed water tank. This liquefied alkaline formulation is processed prudently to make it synergized with pH boosting and water conditioning characteristics. Our offered chemicals are highly compatible with various other treatment chemicals that improvise its usability. These chemicals are superiorly known for their unique attributes such as biodegradable, excellent minimization of scaling & deposition, safe to use, impeccable pH boosting capacity, reduces corrosion and long shelf life. These precise formulated chemicals are used in water treatment plants, food industries, dairies and breweries for minimizing the corrosion. Boiler water pH boosters, Alkalinity Builder, Drinking Water Alkalinity Builder, pH Reducer etc. are the main products which we cater under this category to provide a boosting to the alkalinity in the feed water. We are able to provide guidance incase experiencing an issue with products we supply that can be effective for a plants operational efficiency.